Wake up to another beautiful day in paradise when you reserve a North Myrtle Beach condo rental at Crescent Towers II. This oceanfront North Myrtle Beach resort has North Myrtle Beach vacation rentals that overlook the sparkling blue swimming pool, the white sandy beaches and the turquoise Atlantic Ocean. Make reservations for a North Myrtle Beach condo rental at Crescent Towers II for your next North Myrtle Beach vacation and you may choose a two-bedroom vacation condo that sleeps six people. 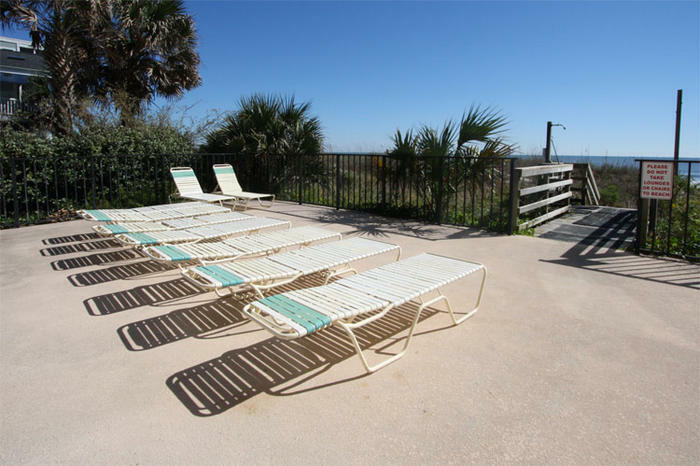 All of these condos in North Myrtle Beach, South Carolina are two-bedroom, two-bath North Myrtle Beach rental that accommodate six people for one terrific North Myrtle Beach vacation. Crescent Towers II is a mid-size North Myrtle Beach resort with nine levels of North Myrtle Beach vacation rentals. There are only four North Myrtle Beach condominiums on each floor of this Myrtle Beach resort so you will enjoy plenty of privacy during your North Myrtle Beach vacation at Crescent Towers II. The swimming pool at this North Myrtle Beach resort is right on the oceanfront. Lounge beside the swimming pool and catch some rays while you are close enough to the Atlantic Ocean to hear the ocean waves come ashore. Through the fence that surrounds this beautiful swimming pool you can see and hear the sea oats that cover the dune line and rustle in the gentle breezes. Inside each one of these two-bedroom condos in North Myrtle Beach, South Carolina you will discover a relaxing ambiance for your North Myrtle Beach vacation. The décor for each North Myrtle Beach vacation rental at Crescent Towers II is different from condo to condo. But some features and amenities are the same regardless of which two-bedroom North Myrtle Beach condo you choose at Crescent Towers II. All of these North Myrtle Beach rentals have high-speed Internet access. Easily get online during your North Myrtle Beach vacation. Just bring your laptop computer and log on. All of the North Myrtle Beach vacation rentals at Crescent Towers II have a kitchen that is nicely furnished with cookware and dishes. There are full-size appliances in these kitchens and you will even find a dishwasher for your convenience. You might appreciate that the kitchens at Crescent Towers II overlook the dining area and the living room so that all six people in your party can be part of the same conversation while still being spread out a little bit for comfort. There is plenty of counter space in the kitchen and also a breakfast bar that makes serving a quick snack and a bowl of cereal in the morning really easy for the cook in your family. A microwave in the kitchen means you can quickly make some popcorn for the family to enjoy, perhaps on the oceanfront balcony while you want the moon come up. Elliott Beach Rentals is not affiliated with onsite management or the HOA of Crescent Towers Ii.